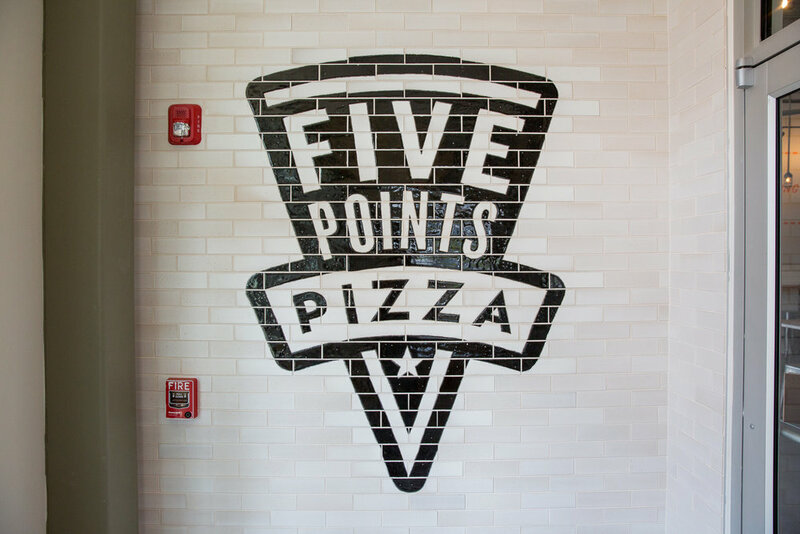 The owners of Five Points Pizza had a tall order: creating a second location in West Nashville that echoed the character of their much-loved East Nashville flagship, which is housed in a charm-filled mid-century building, but doing so in a new-construction build-out. 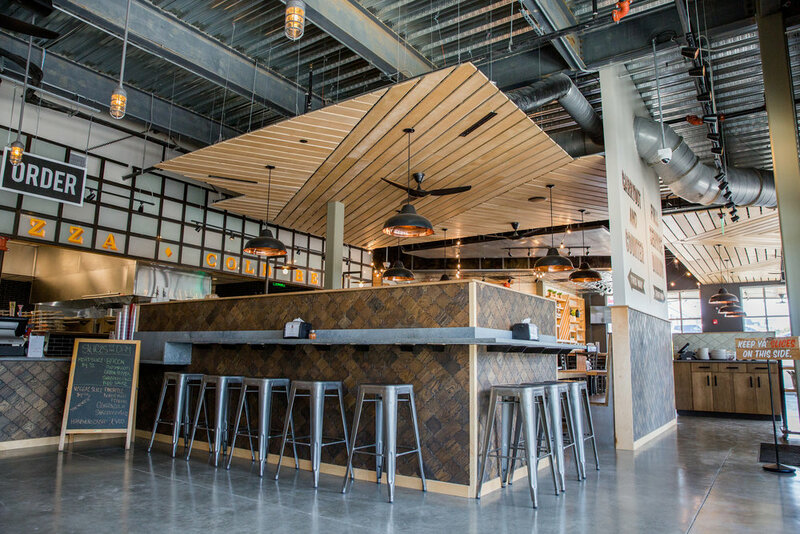 To meet that challenge, the Powell team approached the new space with a largely industrial palette — taking influence from the existing and eye-catching metal truss ceiling — and weaving in wood accents from the ceiling to the seating, which warm the space and help break up the visual and literal noise. 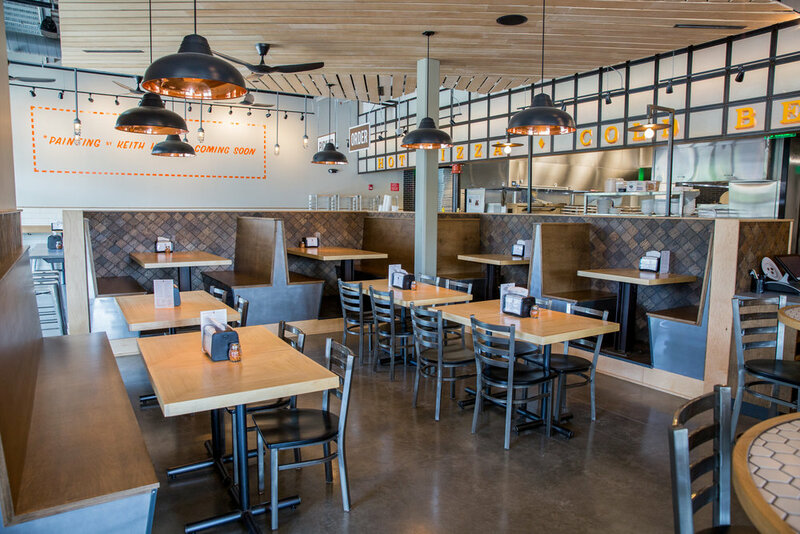 Some specific materials and motifs carry through from East to West: stretches of clean and crisp black and white subway tile; die-cut patterned wood bar fronts. 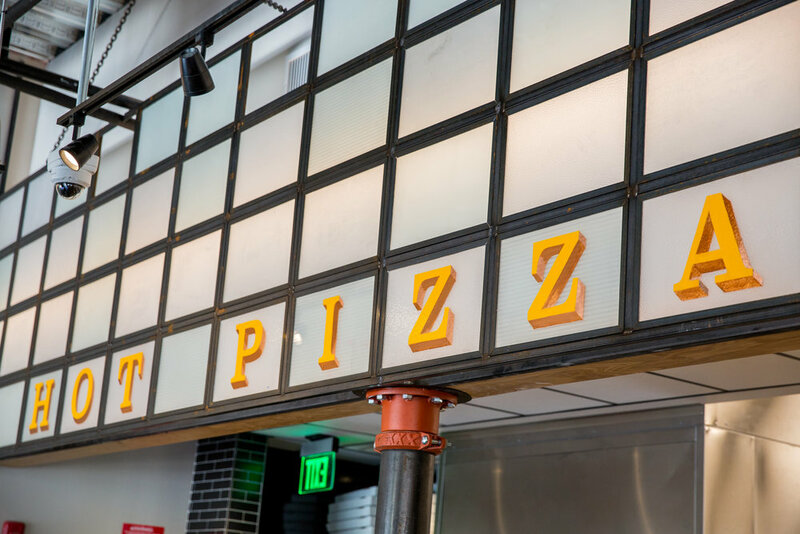 But Five Points Pizza West has its own, classic-and-cool personality, with custom details ranging from brick tile from local makers Red Rocks Tileworks, to glass and steel windows with copper-leaf lettering to add extra character. 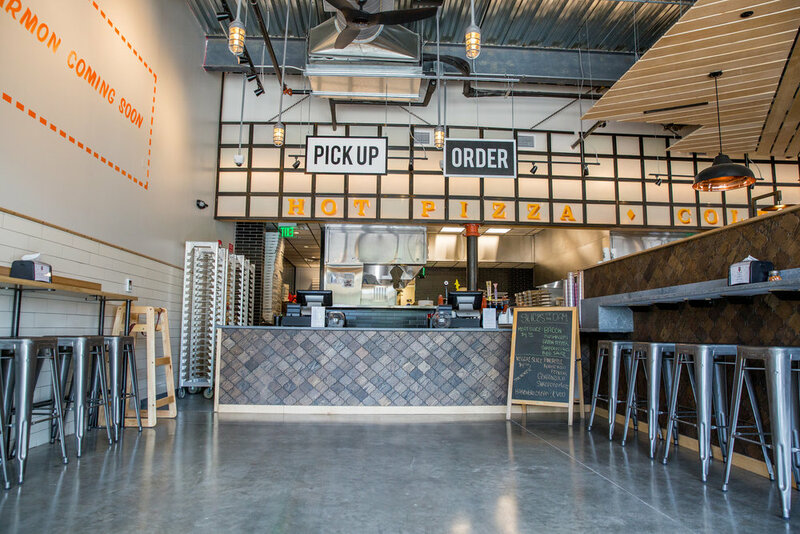 A custom bar was designed with innovative Arabesque plywood details anchors the Five Points Pizza West Take-Out Slice Shop. 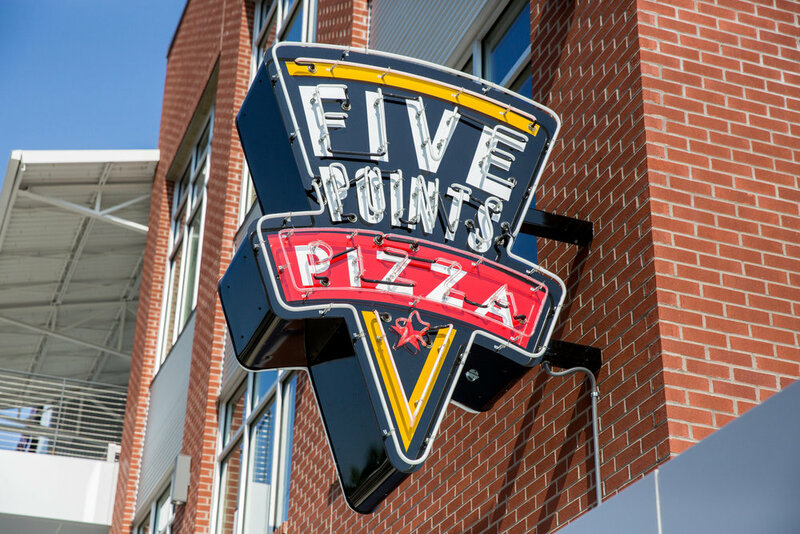 A multi-point restaurant like Five Points Pizza West — with dining room seating for 66 inside and 28 outside, a full bar with seating for 12, plus a Take-Out Slice Shop with additional stooled seating for 28 — required purposeful signage that was effortlessly clear, and just as stylish. 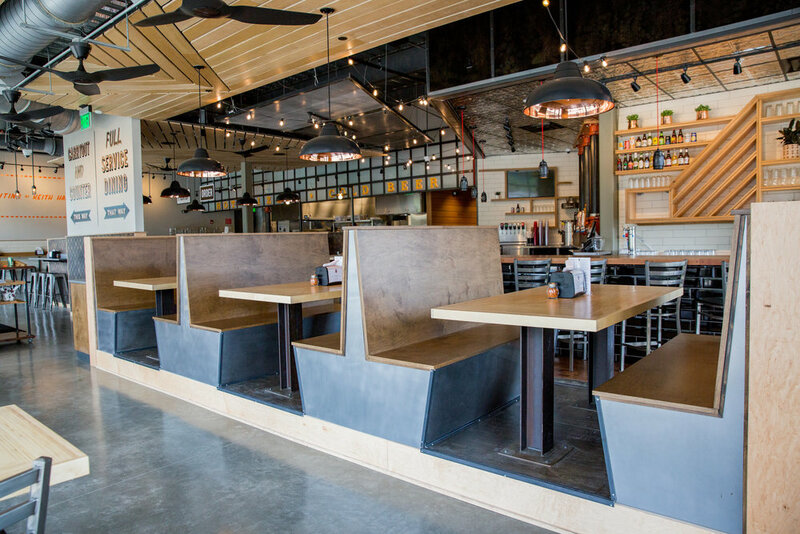 The team collaborated with Nashville’s I Saw The Sign to offer bold, beautiful, impactful wayfinding.